Could Doulas Be Part of the Solution? Doula UK welcomes the publication of a report making clear that the NHS would save millions if women were supported to breastfeed longer. Currently, 81% of new mothers start breastfeeding in the UK, but only 7% are still feeding with breast milk alone at four months. The researchers behind the new report pointed out that surveys have shown that most women stopped before they would like to because of problems. NHS Guidance is that babies should be exclusively breastfed for the first 6 months, with no specific guidance on how long to continue breastfeeding for. The World Health Organisation (WHO) advises that babies should be exclusively breastfed for the first 6 months, with continued breastfeeding along with appropriate complementary foods up to two years of age or beyond. A survey of doula-supported births in 2013 found that 78% of new mothers were exclusively breastfeeding, compared to a national level of 21%. 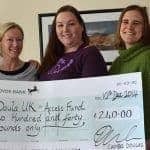 If more new mothers received the support of birth and postnatal doulas, then the NHS could save millions. “We have long known that many women are stopping breastfeeding before they want to, because of a lack of good support. Women working with doulas have far greater rates of establishing breastfeeding than is seen nationally. The one-to-one, balanced and non-judgemental emotional, practical and informational care doulas offer has a very positive impact on a woman’s ability to breastfeed for as long as she wants. Women need far better support with breastfeeding. More midwives and health visitors are needed, but they also need better training in supporting breastfeeding and there needs to be fast, universal access to breastfeeding counsellors, lactation consultants and skilled tongue-tie clinics for those mothers who need more complex support. Doulas could well be part of the solution, but more investment is also needed.